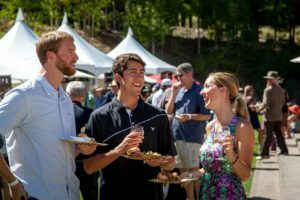 The 33nd Lake Tahoe Autumn Food & Wine Festival at Northstar California on September 7-9 is one of Northern California’s premier gourmet gatherings. Attendees enjoy three days of events, including hands-on cooking demonstrations, beer and wine tastings, food and wine seminars, mixology classes, a backyard barbecue, wine and beer maker luncheons, a “farm-to-Tahoe” dinner on the mountain, a gourmet marketplace, and a kid’s zone. Seminars for this year’s festival range from intimate tastings to large-scale, gastronomic celebrations in the Village at Northstar. The finale is the Grand Tasting, featuring food from the region’s finest restaurants, prepared by top local caterers and chefs, and paired with premium wines and craft beers. Along with the Lake Tahoe Autumn Food & Wine Festival, Tahoe-Truckee’s other culinary adventures include farmers markets, the Alpen Wine Festival at Squaw Valley, a Tahoe Fusion food trailer at Homewood, Guitar Strings vs. Chicken Wings at Squaw, and the Thunderbird Lodge’s winemaker dinners and lakeside food and wine fair. The 9th annual Sample the Sierra at Bijou Community Park in South Lake Tahoe brings together the region’s top chefs and restaurants with neighboring growers and farms to create delicious samples paired with the appropriate wine or craft brew. Now in its 15th year, the Downtown Truckee Wine, Walk & Shop is one of the town’s leading annual events. It draws nearly 1,000 locals and visitors to sip wine and sample local food tastings while shopping in historic downtown Truckee. Attendees sample wine at more than 30 locations and receive a commemorative wine glass, as well as five food tickets and a map to all participating venues.